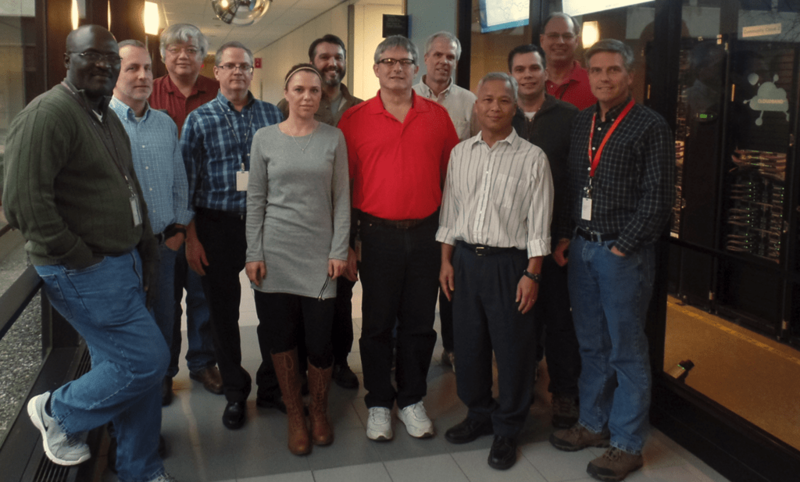 Lean NFV Ops Workshops at CIC. We have hosted a number of workshops with customers, partners, analysts and public officials worldwide. Back in November we welcomed Light Reading analysts in Naperville, IL, who had meetings with IP Platforms’ leaders and joined a live demonstration at the Cloud Innovation Center (CIC). ‘[R&D work] is in the operations,’ Bhaskar Gorti, Alcatel-Lucent (NYSE: ALU)’s president of IP Platforms, told Light Reading without hesitation at a recent on-site visit: ‘Getting a network function to run in a virtualized network is fine, but the reality is that there will be a hybrid world of virtual and physical networks. How do you operate it?’ In fact, its Naperville, IL. 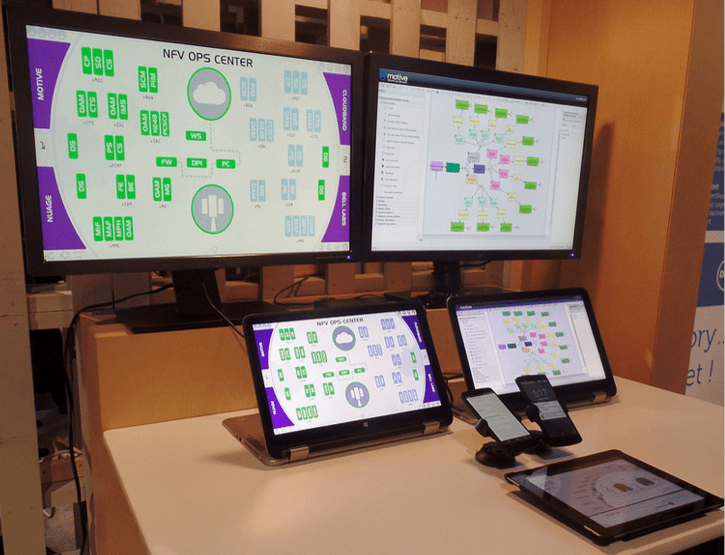 offices are full of Lean Ops demos that show evidence of this R&D work.” – Alcatel-Lucent’s NFV Boss: Operations Is Key R&D.” by Sarah Thomas, Editorial Operations Director at Light Reading. “A visit to Alcatel’s Lucent’s Naperville, IL. Campus, west of Chicago, shed light on how the company is focusing its efforts around software and the cloud.” “Ted East showed us how easy it is to spin up services like firewalls in the cloud, thanks to SDN and NFV. Then he had us cause a network failure by playing Whack-a-Mole in order to demonstrate how fast the network can rebuild itself.” – “Alcatel-Lucent Field Trip” by Elizabeth Miller Coyne, Editor at The New IP. 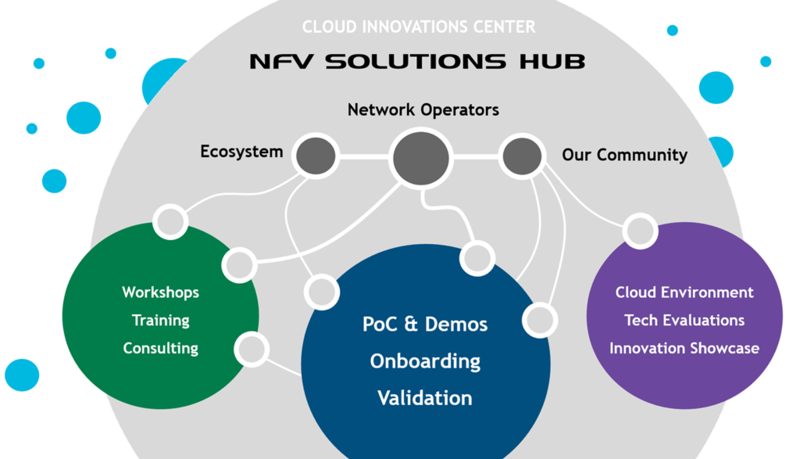 CIC’s NFV Solutions Hub provides a truly immersive operational experience of running a cloud based telco using NFV technologies. 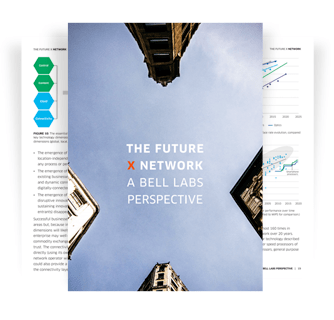 The hub advances collaboration with network operators and ecosystem partners by enabling real solutions to be built and validated as well as providing a hosted cloud facility for the Alcatel-Lucent community. The most visible outcome involves Proof of Concept (PoC) projects, high impact demonstrations and practical assistance with onboarding and validating Virtual Network Functions (VNF). Light Reading’s team experienced CIC’s Lean NFV Ops program, which showcases a fully virtualized end-to-end VoLTE environment and a wide range of service lifecycle use cases and operations. An interactive demonstration deploys Rapport Cloud Communications and IPR&T Cloud Mobile Core (vEPC) working with Motive Dynamic Operations (MDO), CloudBand Management System, and Nuage Network’s Virtualized Service Platform (VSP). This is all running live using commercially available software including CloudBand Nodes which leverage OpenStack and is widely considered the most stable and mature platform for NFV. Furthermore, this session also promoted the role of our Ecosystem Program with over 60 members and positioned Services and Consulting practices, which are currently helping to deliver 6 commercial NFV projects and discussed the impact of Bell Labs research findings. The team at the Cloud Innovation Center (CIC). 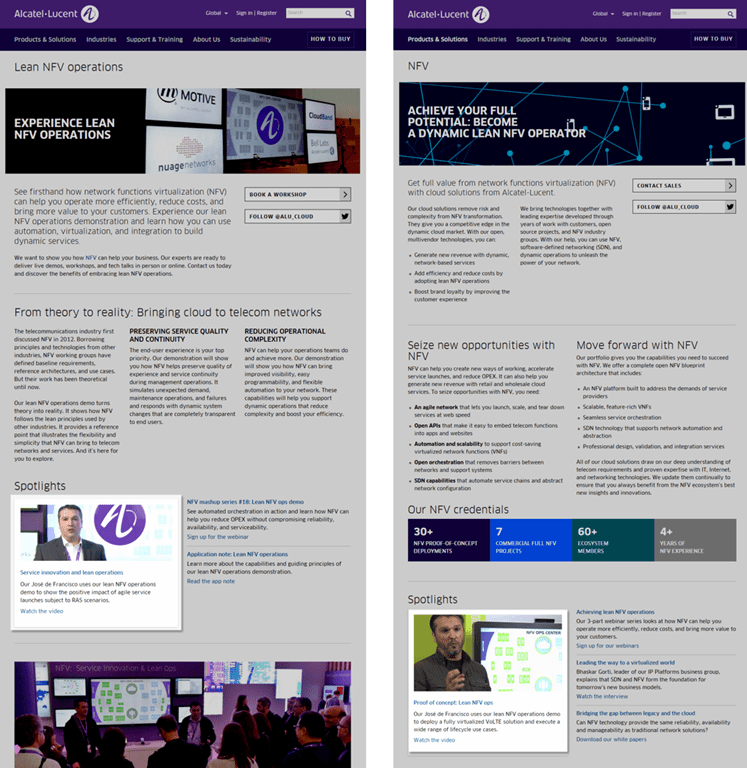 The Lean NFV Ops demonstration experience was launched at Mobile World Congress in March and has been turned into a program that has been featured in 70+ events and workshops worldwide, engaging 1,600+ industry representatives. These help not only discuss and validate fundamental concepts but also gather invaluable customer insights in the process. Intel’s Data Center Group Leadership singled out our program in their Investor Day where Alcatel-Lucent was the only partner featured in the demonstration zone. Intel has also funded and sponsored our most recent video, which is now available on TelecomTV. Customized Lean NFV Ops workshops, whether at Executive Briefing Centers (EBC), at customer premise or online, can be easily booked online. 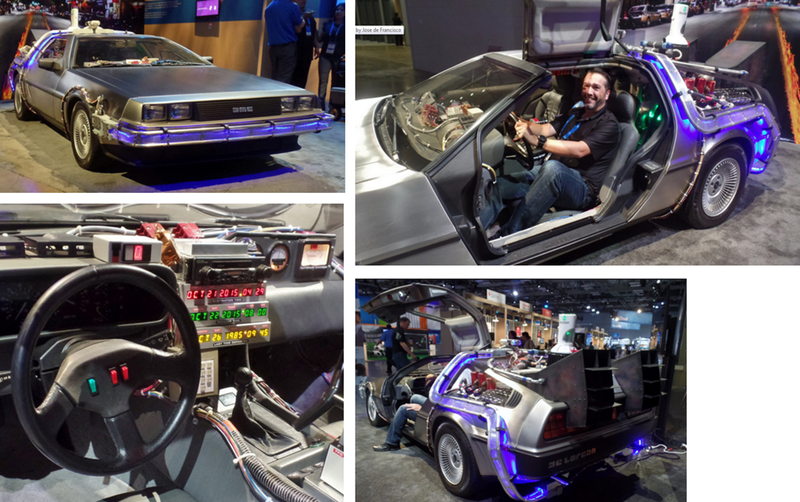 LEFT: Experience Lean NFV Operations includes “book a workshop”. 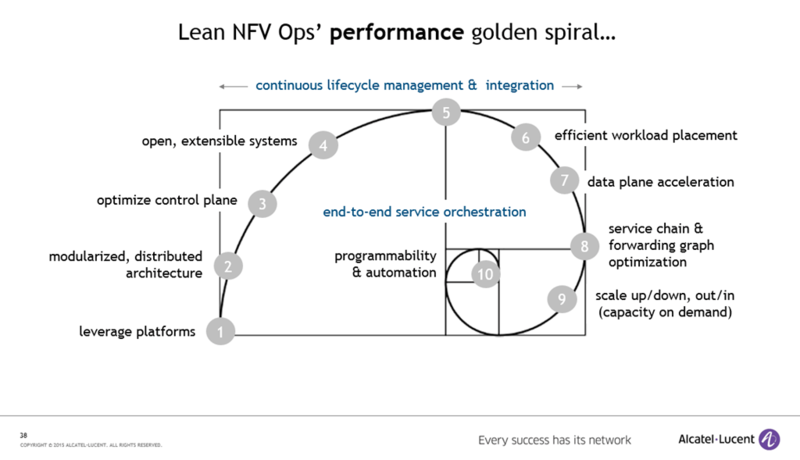 RIGHT: Become a Dynamic Lean NFV Operator. I would like to take this chance to thank Ted East and Phil Tilley for their input.